The Birmingham Comics Festival claims another victory in its battle to ensure a great day out for all takes place by announcing Keith Page, veteran artist on over 200 issues of Commando, will be attending the show on Saturday 18th April 2015. From pop culture to the truly iconic, Keith Page – who as we mentioned earlier this week, rarely attends comic events, so this is something of a coup – has drawn so many familiar characters that we Brits have grown up with since the late 1970s – From Dan Dare and Joe 90 to Strontium Dog and Sonic the Hedgehog, they all spring to mind; as might dear old Supergran for those with longer memories, while a Charlotte Corday book is quite the thing to be seen reading on the current graphic novel scene. Keith Page’s art conveys detail, be that on a battlefield or down a cobbled London street, but there is also a sense of the impressionistic at work, and true characterisation in his portrayal of tragedy, whimsy and charm. He is unique, and a true British talent. His consummate skill has been found between the pages of The Eagle, Starblazer, TV Comic, Scream, Football Picture Story Monthly, The Beano, The Dandy, Bunty and others. He has drawn the exploits of the international rescuing Tracy family extensively for Thunderbirds the Comic and also The Sunday Times newspaper. Keith signed on with the prestigious London-based Temple Art Agency in 1976 and began illustrating for Fleetway/IPC and DC Thomson’s weekly titles as well as annuals as diverse as 2000AD and Supergran in a Britain where reading comics was a natural part of daily life for most kids. He was to illustrate sci-fi epics for Starblazer pocket books and the aviation-adventure serial “Tales of the Gold Monkey” in Polystyle’s TV Comic, both wrote and drew “Martello 112” for Revolver and become Dan Dare’s artist on The Eagle. In 1992 he would begin an extensive run illustrating Thunderbirds for both the comic and The Sunday Times, then in 1996 he commenced his even longer run producing material for Commando, notably the famous “Ramsey’s Raiders” series and more recently themed books. There are children now reading newsstand comics whose grandparents may also been brought up engrossed in Keith Page’s work between the pages of The Beano, MASK, Wildcat, Supernaturals, Scream, Stingray the Comic, Joe 90, Football Picture Story Monthly, Bunty, The Dandy, Sonic the Comic, Mighty Max and others. And yet, since his artistic debut within the pages of the Denis Gifford produced Ally Sloper, there has also been something of the free spirit to Keith Page. Recent years have found him exploring these possibilities, writing and drawing the Dan Dare-related “Rocket Pilot” for Spaceship Away, and collaborating with screenwriter Stephen Walsh on their critically popular graphic novels about the French secret agent Charlotte Corday. To this day his work for Commando continues apace, having completed a World War One series “Great Warriors” and now illustrating an “Eagles in Battle” series while Charlotte Corday, co-created with Stephen Walsh, has appeared in three graphic novels to date: Iron Moon (available digitally through ROK Comics for iPad), London Calling and Squadron of the Screaming Damned, the latter two published by Time Bomb Comics. A Charlotte Corday spin-off, Plunger’s last Case, will be published by Time Bomb in March. 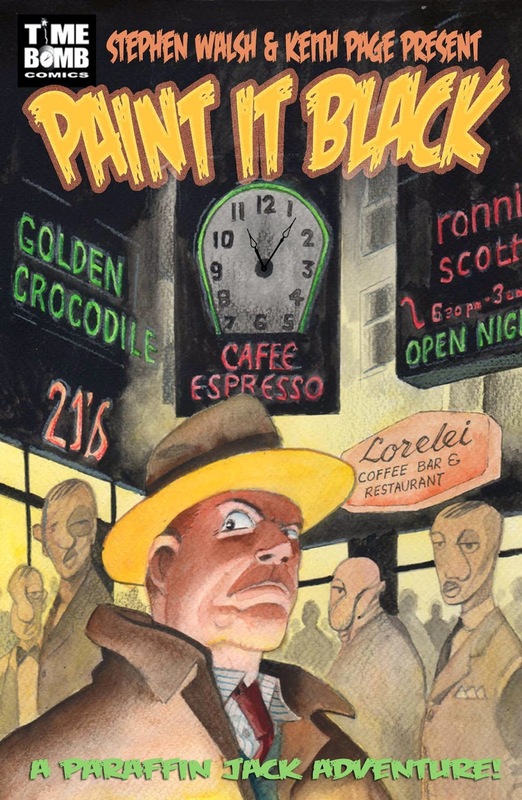 Keith has similarly developed The Casebook of Bryant & May into graphic form with the author of this uncanny detectives series Christopher Fowler, and their first collaboration, The Soho Devil was published by PS Art Books.